There you have it! The Mariners took to the challenge against the Texas Rangers and proved that something is brewing with this young ball club. After sweeping the Rockies in a great finish to a horrible road trip, many skeptics questioned whether or not the Mariners were turning a corner or if they just played well against a terrible team. After today's game, there will be skeptics still, but maybe a bit less. Although there are still troubles for the Mariners when it comes to hitting with runs in scoring position, they are showing a tremendous amount of patience at the plate and it's paying off. Throughout the series the team collected a total of 15 walks. Yes, 15! The trouble is, even though we had all of those free base runners we didn't score a lot of runs off of them. Today, Alex Liddi tried to reverse the curse when hitting with runners in scoring position. If he didn't break the curse, he at least made the numbers look a lot better. Facing Scott Feldman in the 5th inning with the bases loaded, Liddi hit a line shot over the left field wall on the first pitch for a grand slam. 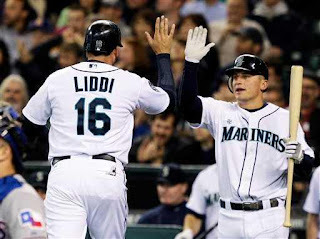 It was the first grand slam of Liddi's career and his 3rd of the season. You can watch the video here. The true key to success has been our starting pitching, not our offense. The Mariners starting pitchers combined in the series for 22 innings, allowing only 12 hits and 4 runs against the most highly touted offense in the league. Hector Noesi took the loss in game 2 as he surrendered 3 runs in one inning and the Mariners couldn't get any production off of Matt Harrison. Felix Hernandez was spectacular, Noesi was amazing and Kevin Millwood was dynamic in his 3rd consecutive start as he held the Rangers scoreless through 6 innings on just 3 hits. So, the Mariners have turned a corner as of late. I just don't think it's the offense that has turned things around. I believe it's the pitching. Our next series is against the Angels who have been keeping pace with the M's in the past couple of weeks. Just a half game behind in the division but carry a 9 and 15 road record on the year. The Mariners will send Jason Vargas to the hill against the Angels Dan Haren. Haren is just 1 and 5 with a 4.37 ERA, while Vargas is 5 and 3 with a 3.34 ERA. Another great series is in order, let's keep the momentum going and the bats will surely follow. Thank you Alex Liddi for stepping up huge today!